So you have found the perfect plant containers. What now? Think about how you will display those containers. Will it be on a plant stand or plant hanger? Will you hang your plants from a wall, ceiling or somewhere else? Some people choose to place a saucer or some other type of container under their plants to catch the overflow of water when they water their plants. Will you water with a watering can or self-watering stakes? 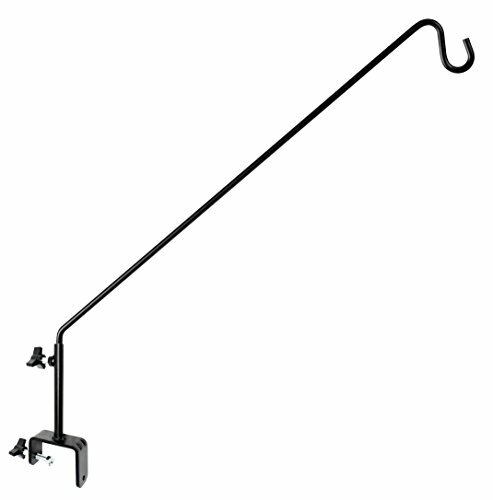 Here you will find hooks, hangers, racks, saucers, stands, caddies, liners and so much more. All of the plant container accessories you need are featured here in one place for your convenience. So go ahead and plant greenery, vegetables, flowers and anything else your heart desires! Black Traditional Hanging Basket with Coco Liner, 12" Diameter. 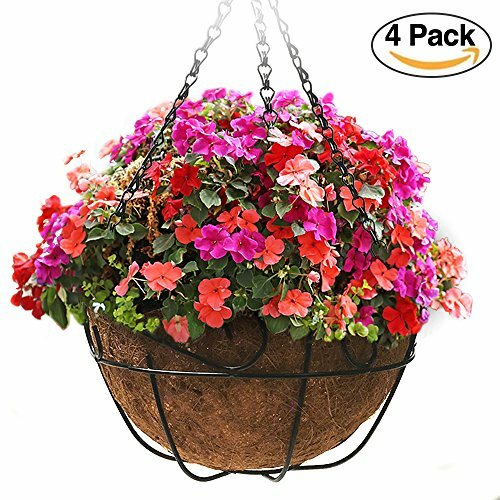 Sturdy round hanging grower basket constructed of strong steel rod with a tough black vinyl coating for long-life. Attached to basket for trouble free hanging are: a black vinyl coated hook and three heavy-duty black vinyl coated steel chains. A pre-formed coco liner is conveniently attached to basket for easy filling. 7" depth provides excellent soil volume and a flat base assures tip-free filling. Coco fiber provides superior drainage and aeration promoting fuller and healthier plant development. Planting tip: adding a plastic liner will help hold moisture in so you can water less often. Use something as simple as a grocery sack. Poke holes in the plastic liner to allow planter to drain adequately. - Perfect for holding household or garden plants as well as everyday household items. - The chains clip to the loop at the top of the basket and provide balance when hanging the basket from the ceiling or your chosen hook attachment point. - Both the hook and chain are removable and allow for adjusting the height of the basket to your desired level. 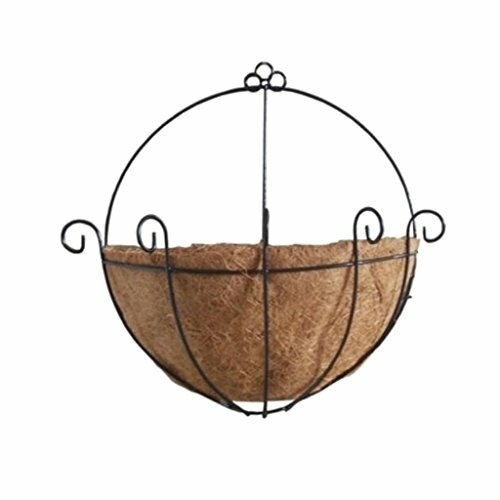 - Natural coconut liner helps to hold your plants or miscellaneous objects inside. - Looks great as an exterior or interior decoration. Plant basket liners, especially the coconut fiber liners can hold a lot of water and release it slowly to allow plant roots to better absorb it. They also provide great drainage, so your plants will be healthier and not water logged. Some coconut basket liners also contain anti-fungal properties, which may discourage disease in your plants. ​​Add a lovely display beneath two of your favorite potted plants using these Panacea Brown Cameo Plant Caddies. A generous, steel frame with a brown, powder coated finish lends a timeless look to each piece, while a plastic tray accommodates your round, oval, or square planter. A dual top ring keeps your planter in place, while additional steel rods form heart shapes on the base for added strength and style. Casters not only elevate these items off of the ground; they also allow you to move your plants easily for the right amount of sun and shade. 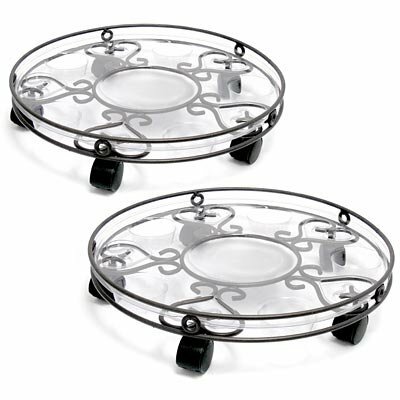 Circular depressions on the plastic trays capture any overflowing water, preventing staining on your patio, and the items easily hold 16" diameter or smaller pots. The steel and plastic construction is fantastic for use on a deck or in your sunroom, while the bold detailing on these units captures attention. Keep your plants off of the ground using these Brown Cameo Plant Caddies. 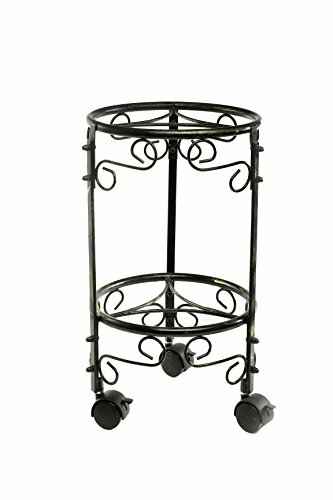 This Dual Metal Plant Stand caddie make heavy potted plants easy to move. A back saver when housecleaning or moving ferns, ficus or other large plants. The caster wheels glide over carpets or floors without marring or tipping. They can be used indoors as well as outdoors. Perfect to decorate your potted plants in your living spaces. Each Plant caddy is 8.5"H apart, so you can easily place another potted plant on the bottom caddie. 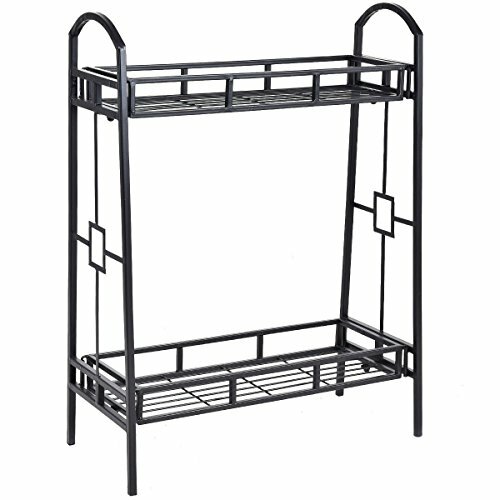 Dual Metal Plant Caddie is made of cast iron with a black and gold finish. Be able to hold 12" Potted Plants comfortably. Caster Wheels measures 2.5"L x 1.75"W x 2.25"H.
Plant caddies are an easy way to move your plants around inside or outside. They are especially nice with heavy plants, or those that are tall and difficult to move without a caddy. ​ Choose from a variety of sizes and styles below. 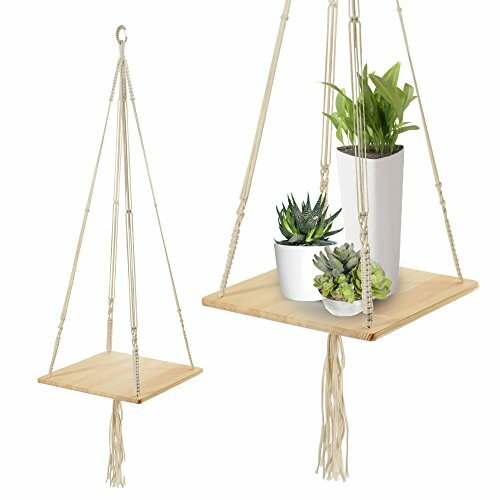 ​Show your plants some love and create that dreamy, elegant, bohemian vibe in your abode with the Macrame Shelf Planter Hanger by California Home Goods. Your modern home deserves nothing less. It’s natural for us to want to be one with nature, so it’s no secret that we love adding plants to our indoor spaces, they purify our air and add that much needed positive ambience. Why not do it in style? Introducing our macrame shelf planter hanger - it’s just what you need for your plants to beautify any indoor or outdoor space in your home or office. Hung off a hook on the wall or ceiling, the shelf planter hanger is perfect to showcase your small cactus, succulents and hanging plants. Bring life, color and texture to any room! You can use plant hooks and hangers for your indoor or outdoor plants. Keep them out of the way and beautifully displayed on a hook or a hanger. Use them over windows, on banisters, on walls, etc. 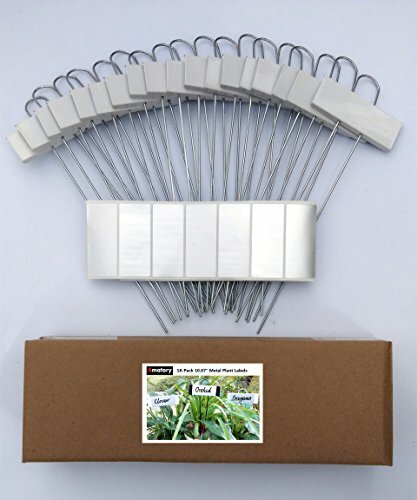 ​The metal plant labels are perfect for potted plants,vegetables,herbs,flowers,nursery stock,greenhouse and etc. The self-adhesive polyester labels are waterproof and corrosion resistance. 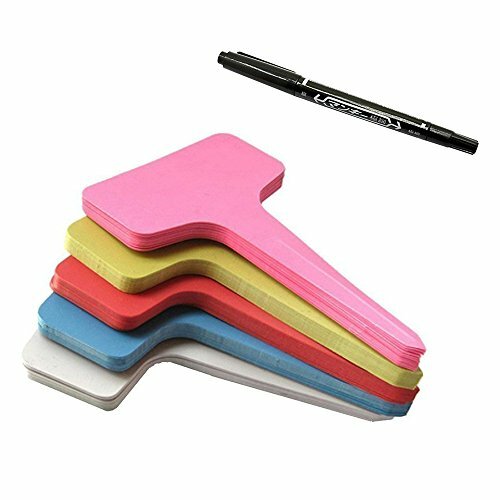 You must use an oil-based pen to write,not use a water-based pen. Great for home garden,nursery garden, and other small farm garden. Now you can remember what you plant and where you plant it with these plant labels. Use them in gardens or individual pots. ​ Great for keeping track of your planting projects. Use them for plant names, dates planted, or anything else you desire. This is an elegant multi-storey wooden flower rack. 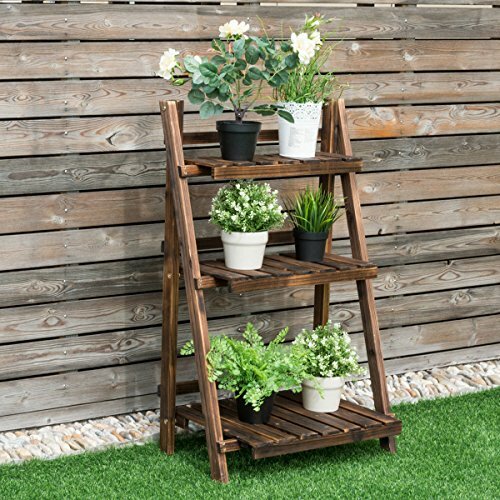 This charming flower plant stand adopts the durable natural wood construction, which is very sturdy .This multi-functional flower rack not only is a flower rack, but also can be a bookshelf, display stand, shelf, decorative stand, etc. 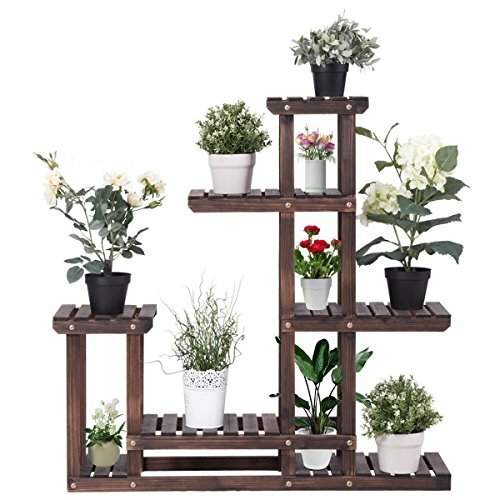 This multi-storey flower rack with high and low layer design, is able to place enough pots of plants. It can be placed your favorite potted plants or your shoes, handbags and other items. Perfect for any place, balcony, living room, outdoor and so on. This beautiful flower rack will decorate your home, deck, or patio. Don't hesitate to buy it now ! This 3 tier wooden folding flower racks which is very sturdy because of the durable natural wood construction. The elegant and beautiful appearance complements most existing plant. It is exactly the right combination for your garden pot. What's more, this 3 tier flower rack not only is a flower rack, you also can do as a bookshelf, display stand, decorative stand, etc. This folding design flower racks is easy to move or storage . It can be placed your favorite potted plants or your shoes, handbags and other items. Perfect for any place, balcony, living room, outdoor and so on. This beautiful flower rack will decorate your home, deck, or patio. Don't hesitate to buy it now ! Plant racks are a great way to display single or multiple plants both indoors and outdoors. They also add a decorative touch to any space. ​ Display house plants, flowers, herbs and anything else your heart desires. Sturdy and Durable to hold heavy plant pots and any dripping water. Excellent for placing under planters to protect surfaces from water. No more worries about dampness damaging the boards. 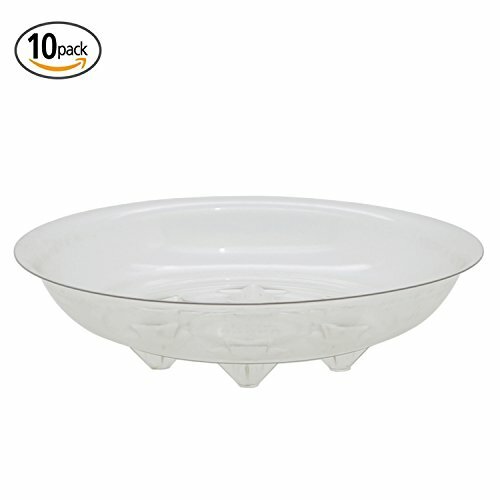 Clear plant saucer will be a good match for your beautiful and decorative plant pot. They are clear and not distracting to other décor. You can barely notice it when looking at the plant. The design makes the plant look like it is actually floating so you don't feel like the base is really there. 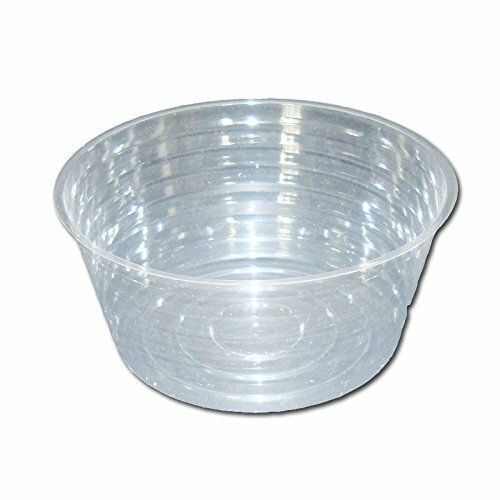 The rePotme Crystal Clear Saucers are durable and designed to support maximum weights of your potted plants and allow for better drainage. Perfect for plastic, clay and ceramic pots to protect surfaces and to retain water underneath the pot for added humidity. Can be used with our cork mat coasters to protect furniture. All of these clear plastic saucers are 100% blue box recyclable. When deciding which saucer would be the best fit for a particular pot, it is usually best to pick a size larger than the pot diameter because you would like to allow ample room for drainage. The capacity of the saucer to hold more water is directly related to the size of the saucer. Most pots taper down to the base, so a 6" pot will be somewhat smaller at the base and it will fit into a 6" saucer. If you want more water holding capacity, we would suggest an 8" saucer. Plant saucers keep wet messes off of your floors by providing a place for water overflow to go when you water your plants. ​ They also keep surfaces clean from dirt and roots which tend to leak out of pots with holes in the bottom. Take a vacation and let Blumat Jr. look after your plants! Blumat Plant Savers ensure a constant water supply by siphoning water from a container to your plants and they will love it. With Blumats, your plants won't experience any drying out that stunts growth or over-watering, which squeezes air out of the soil and doesn't allow your plants to "breathe" properly. Slow, continual watering encourages prolific growth. Blumat Juniors only draw water up about 12 inches (30cm). Be sure to place your container within a 12 inch range to keep your soil, and plants, from drying out. Each Blumat Jr. holds a limit on how fast it can deliver water. Multiple Blumat Juniors and a larger water container are helpful for larger plants, in order to meet greater water needs. You can adjust moisture levels by moving the water container higher or lower - higher than the plant for tropical plants, lower than the plant for cacti and succulents, and at the same level for most other types of plants. These are original Blumat Juniors, specifically designed for houseplants. These are made in Austria, not poor quality Chinese-made versions that do not work well. ​Get started using Blumats with this simple, low-cost Starter Kit. 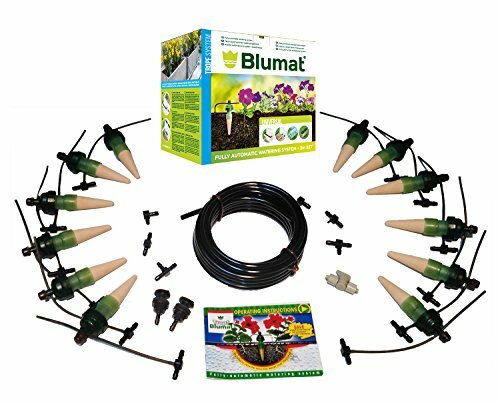 If you only have a few plants or you'd like to learn how Blumats work before converting over to a larger system, this kit is just right for you. This kit is made for a gravity-fed system (does not include fittings to attach to a hose bib or pressure system). This Kit Includes: 5 Blumat carrots (5") A thru-the-hull adapter for attaching to a reservoir (reservoir not included) 3mm-to-8mm end piece 7 meters of 8mm Blumat tubing Increase your yields and decrease grow times. These fully-automatic, self-watering systems save time, water, and nutrients — and still ensure healthier, more potent, and faster-growing crops. 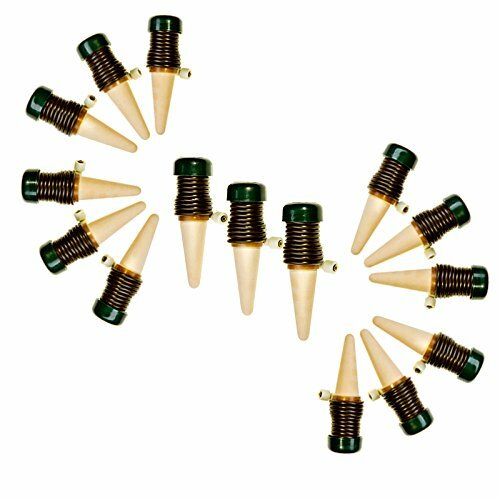 Note: Blumat Classics (Juniors) and bottle adapters are designed for houseplants while Tropf-Blumat Sensors (the one's with the small adjustable brown knob on top) are designed for greenhouses, growrooms, decks, and outside gardens. Blumats Austria says "Please don't use the Tropf-Blumats indoors" because if hooked up to a constant water source and a pet, guest, or user-error somehow causes a run-away, it could damage an indoor floor, drywall, carpet, or furniture. You can use self-watering plant stakes for your indoor and outdoor plants. Simply fill them with water, place them in the soil, and allow them to release water when needed. Refill when necessary. There are a variety of self-watering stakes to choose from, too, so you're sure to find the ideal ones for all of your plants. This item is good for decorate your beautiful garden. When your friends come for visits, they will admire your nice garden and this wonderful decor. That's very good! MATERIAL: Made of high quality metal and glass, durable and stable. ASSEMBLY REQUIRED: Arrives completely assembled, no assembly required. MULTIFUNCTION: Modern accent table for entryway, bedroom, living room. SPECIAL DECOR: Special style and bright color, it is a wonderful yard decor, suitable for use in spring. This black plant stand with beautiful design is a perfect choice for home and garden lovers. It's durable, stable, easy to remove. Give your home, deck, or patio the perfect combination of classic style and natural beauty with this charming planter stand. 2 tiers of shelves provide attractive displays of potted flowers. 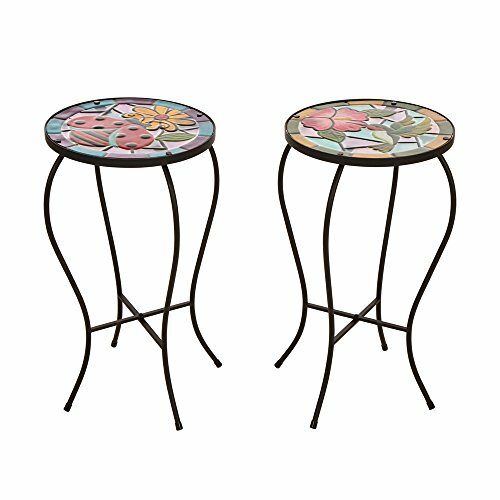 If you are looking for a plant stand, it will be your excellent choice. Don't hesitate to buy it now! Display your plants proudly on any of these lovely plant stands. 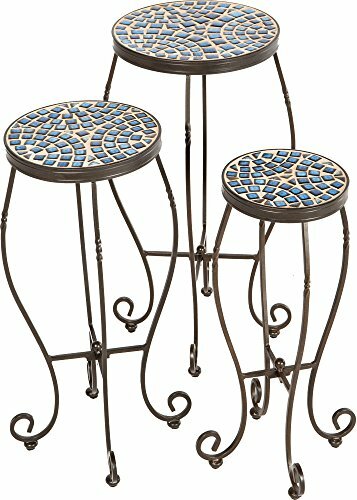 Choose from indoor or outdoor plant stands that hold one or more plants. Use them for herbs, flowers, and other greenery.